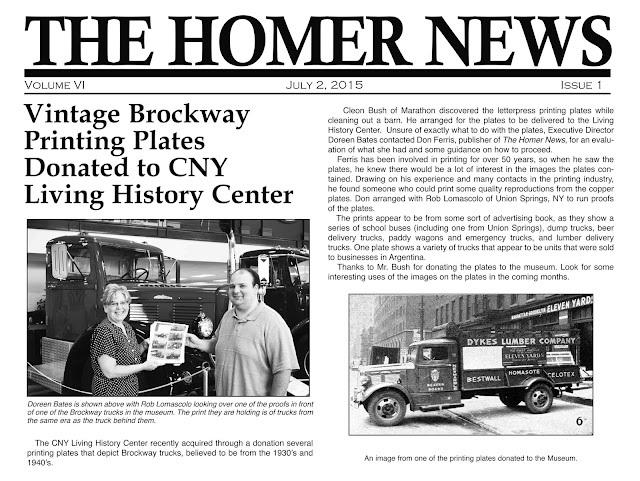 I was in the Homer News for letterpress printing some vintage plates for the CNY Living History Center! “The CNY Living History Center recently acquired through a donation several printing plates that depict Brockway trucks, believed to be from the 1930’s and1940’s. Cleon Bush of Marathon discovered the letterpress printing plates while cleaning out a barn. He arranged for the plates to be delivered to the Living History Center. Unsure of exactly what to do with the plates, Executive Director Doreen Bates contacted Don Ferris, publisher of The Homer News, for an evaluation of what she had and some guidance on how to proceed. Ferris has been involved in printing for over 50 years, so when he saw the plates, he knew there would be a lot of interest in the images the plates contained. Drawing on his experience and many contacts in the printing industry, he found someone who could print some quality reproductions from the copper plates. Don arranged with Rob LoMascolo of Union Springs, NY to run proofs of the plates. The prints appear to be from some sort of advertising book, as they show a series of school buses (including one from Union Springs), dump trucks, beer delivery trucks, paddy wagons and emergency trucks, and lumber delivery trucks. One plate shows a variety of trucks that appear to be units that were sold to businesses in Argentina.